2-1-1 connects people to the assistance they need to address every day challenges of living as well as those that develop during times of community emergencies. 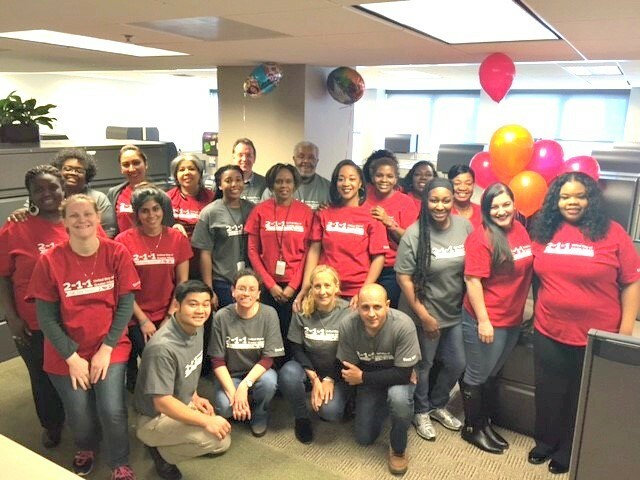 United Way of Greater Atlanta's 2-1-1 Contact Center connects families with community resources that enables them to thrive - resources like food pantries, job search and placement agencies, and financial emergency assistance agencies. This help is provided so that families can recover and become sustainable once again. Those who reach out to 2-1-1 are connected to trained, bilingual Contact Center agents who provide information on services and referrals to programs aligned with the individual's specific needs. There are more than 5,000 agencies listed in the 2-1-1 database. 2-1-1 is free, confidential, and available 24 hours a day, 365 days a year, in over 140 different languages. For more than 35 years, United Way of Greater Atlanta has provided comprehensive Information & Referral (I&R) services to residents of metro Atlanta. From 1973 to 1986, the service was known simply as I & R. In 1987, I & R was renamed to First Call For Help. In 1993, First Call For Help became the nation's first 24/7 I & R line. In June 1997, with the support of community and civic leaders and a technology donation from Williams Communities, the Public Service Commission assigned the 2-1-1 telephone number to United Way of Greater Atlanta. The service was re-named to United Way 2-1-1. In 2011, 2-1-1 started the transformation from a call center to a contact center by offering live chat services through the 2-1-1 website. This allowed the community to independently search for its needs or chat live with a trained specialist. At the beginning of 2014, text services were added. Today, 2-1-1 customers can reach 2-1-1 by phone, through the website, by chat, text, and email 24/7/365. By the end of 2015, 2-1-1 responded to more than 7.9 million contacts. It continues to serve as a model for similar services nationwide, as well as a barometer for critical needs in metro Atlanta. Answering more than 800 contacts a day, all confidential and free, 2-1-1 does more than serve our community. It creates one. Please support 2-1-1 by donating to United Way of Greater Atlanta. Your ongoing financial support enables us to continue providing the services that are vital to our community.